intended to serve the quantitative community in the Netherlands. TopQuants have witnessed an increased number of submissions for the current newsletter issue and we hope the enthusiasm continues. We will strive to maintain the quality of the technical contents in the newsletter and ensure that it is relevant and beneficial to the quantitative community. As always, we are open to your suggestions, and are looking forward to receiving your comments and contributions. TopQuants is very open to the nature of submissions in our newsletter which may include technical articles, research results from masters/PhD work, personal blogs, surveys, opinions (e.g. on newly proposed regulations), reviews of books or articles, coverage of interesting events etc. If there is a topic you would like to bring to the attention of your fellow quants in this country, why not write an article about it for this newsletter? We encourage you to contact us to discuss how it may be done. the University of Amsterdam) who had expressed his views on the state of the Dutch economy and the possible ways going forward. Also find in the summary, a note on the lively panel discussion hosted by TopQuants committee member Bert-Jan Nauta, that included speakers, Sandra Muijs (Head of Model Development at SNS REAAL), Robert Daniels (Senior Client Risk Manager at Cardano), David Schrager (Head of Single Premium Variable Annuity Trading at ING bank) and Coen Teulings himself. Committee on Banking Supervision in December 2012. The second article is by Marco van der Burgt (ING Bank, Market RiskManagement, Model Validation) who presents a potential investment strategy that can be adopted by pension funds to prevent underfunding. study presented by the 2013 Econometrics Game winning team from Universidad Carlos III de Madrid, Spain, which had Guillermo Carlomagno, Andrés García Suaza, Salvatore Lobello, Michelle Sánchez, Pedro Sant’ Anna as its members. Their work was about forecasting the GDP growth of Spain in a datarich environment. We hope you will enjoy reading the broad range of topics offered in this newsletter and we look forward to seeing you at the upcoming TopQuants event(s). 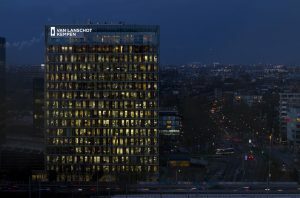 Autumn 2018 will take place at Van Lanschot Kempen’s offices in Amsterdam. Let us know if you want to contribute!